Captain Bluebear tells the story of his first 13-1/2 lives spent on the mysterious continent of Zamonia, where intelligence is an infectious disease, water flows uphill, and dangers lie in wait for him around every corner. "A bluebear has twenty-seven lives. I shall recount thirteen and a half of them in this book but keep quiet about the rest," says the narrator of Walter Moers’s epic adventure. "What about the Minipirates? What about the Hobgoblins, the Spiderwitch, the Babbling Billows, the Troglotroll, the Mountain Maggot… Mine is a tale of mortal danger and eternal love, of hair’s breadth, last-minute escapes." Welcome to the fantastic world of Zamonia, populated by all manner of extraordinary characters. It’s a land of imaginative lunacy and supreme adventure, wicked satire and epic fantasy, all mixed together, turned on its head, and lavishly illustrated by the author. I spent the first 300 or so pages of this book trying to figure out whether it was a children's book for very advanced children or an adult book for readers who hadn't lost their sense of play and wonder. It's whimsically illustrated, audaciously imaginative, and has a distinked [sic] fascination with body odor. But to get some of the jokes, you need to have a passing familiarity with quantum physics, string theory, and academic politics. Eventually I gave up trying to categorize it and just enjoyed the adventure. As Captain Bluebear, the narrator, says in the opening chapters, this is the story of 13-1/2 of one bluebear's 27 lives. (The other 13-1/2? Well, a bluebear must have his secrets.) Captain Bluebear's adventures include: A childhood spent with the Mini Pirates, marauders who are always attacking ships, but, being so small, are never noticed. A partnership with Deux ex Machina, a pterodactyl who saves people from doom at the very last possible second. And schooling under the tutelage of a professor with seven brains. I often found myself laughing aloud as I read, thinking first, "You can't do that!" Then feeling my imagination liberated because Moer had dared to do so. 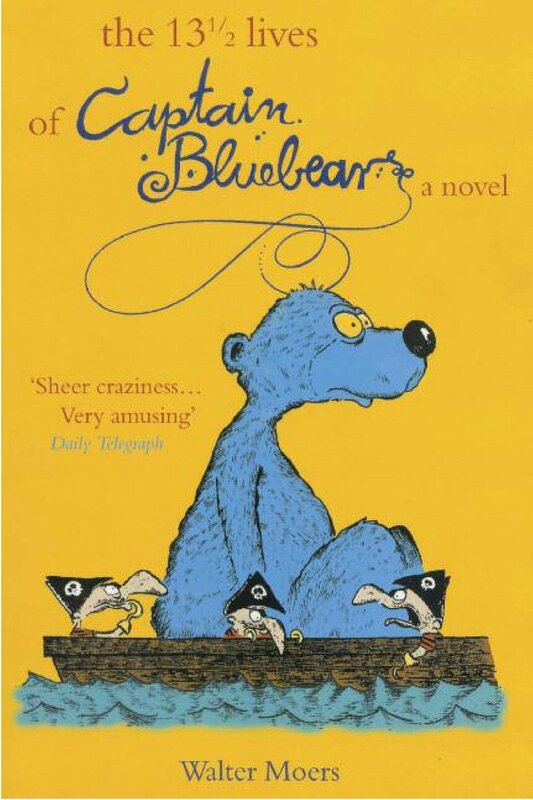 A master storyteller and actor, Captain Bluebear is ever so slightly pompous, but in that adorable way of harmless, well-fed scholars whose generous hearts are more than large enough to contain their puffed up egos.